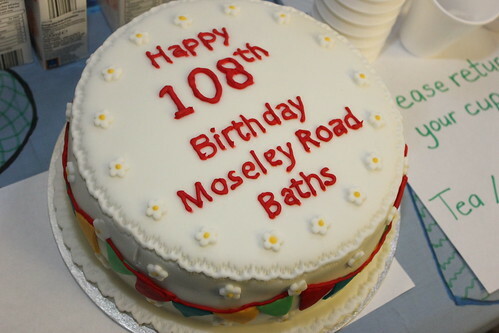 Following the recent announcement that the Baths was to be included on the World Monuments Fund Watch List we decided to hold an open day at the end of October, which would also tie in with Moseley Road’s 108th birthday. Having taken part in Birmingham Heritage Week just six weeks earlier we were a little apprehensive that we’d struggle to attract many visitors this time (between 80-120 is usual for our open days). We were therefore amazed when around 240 people showed up; making this easily the most popular event we’ve stage since our formation in nine years ago. Plans to run four guided tours quickly expanded to seven, additional MRB information sheets were hastily photocopied, extra copies of our Pool of Memories book were brought in as the enthusiasm and excitement of visitors made the Friends’ volunteers forget their exhaustion. 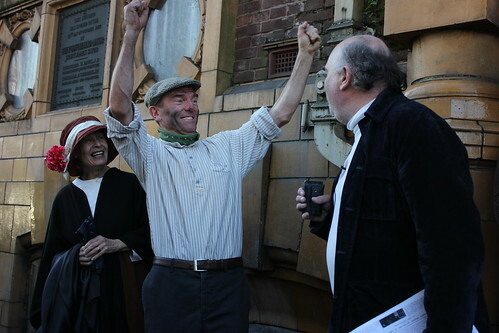 Centrepiece of the day was a re-enactment of the Opening Ceremony, staged in period costume thanks to our friends at Balsall Heath Local History Society. 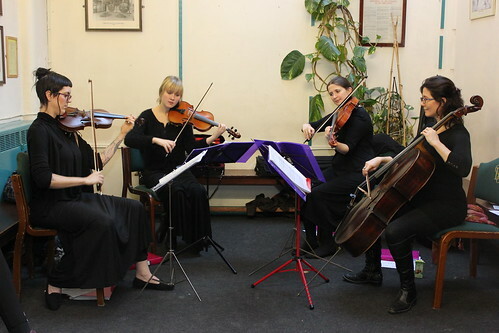 Particular thanks to Martin Mullaney who played the rôle of Deputy Lord Mayor Alderman Reynolds and gave excellent speeches both at the front of the building (to a crowd of up to 80) and then in the foyer, which likely hasn’t been so crowded in years, to the backdrop of a string quartet playing Edwardian period music. The ‘dignitaries’ (architect William Hale, Baths Committee Chairman William Davies, Baths Department Superintendent Job Cox, Resident Money-taker Mrs Hidden and a representative of Moseley Swimming Club ladies section – or Mark, Carl, John, Helen and Philippa as they are better known) each received replica 1907 tickets (or at least our approximation of what one might have looked like) despite the unexpected arrival of a placard waving suffragette (Fran Delaney) and a local factory hand desperate for a wash (Chris Crean)! 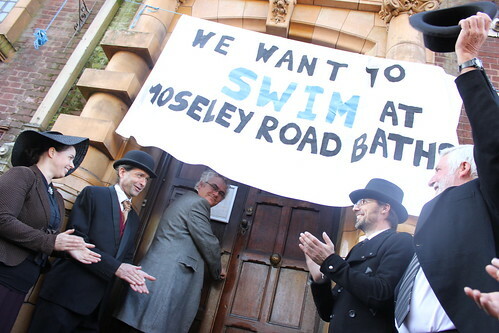 The re-enactment ended with the cutting of a splendid Victoria sponge cake, decorated with Moseley Road Baths birthday greetings. Amongst our many visitors were Balsall Heath Councillor Victoria Quinn and her husband, outgoing Council Leader Sir Albert Bore. 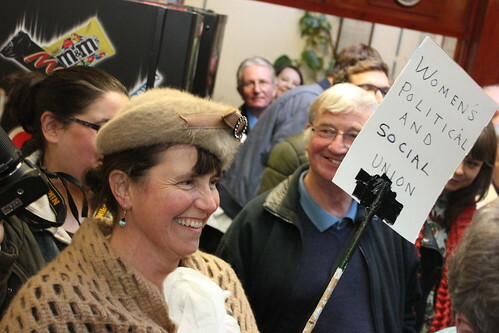 Our thanks as ever to the staff for whom nothing seemed too much trouble, and to the public who came from Balsall Heath, Birmingham and beyond to visit Britain’s finest still operating Edwardian swimming baths.